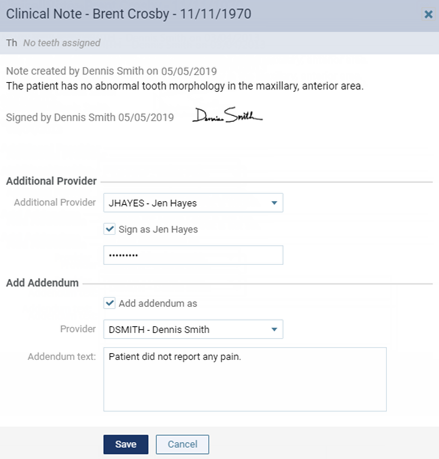 You can edit any clinical note in a patient's record unless that note has been marked as having been reviewed. However, you can add addenda to a locked clinical note. On the Patient menu, under Clinical, click (or tap) Chart, Progress Notes, Quick Exam, Treatment Planner, or Perio. 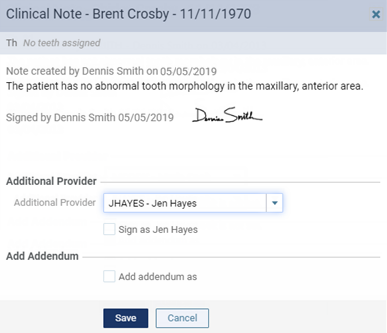 The patient's clinical record opens with the Chart, Progress Notes, Quick Exam, Treatment Planner, or Perio tab selected. Edit the note, or add an addendum as needed. 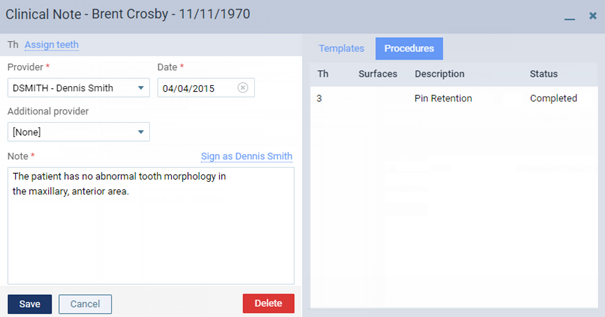 If no tooth numbers are assigned to the clinical note, to assign tooth numbers, click (or tap) the Assign teeth link. Select the desired teeth, and then click (or tap) X. If tooth numbers are assigned to the clinical note, to modify the assigned tooth numbers, click (or tap) the teeth (such as 2-4) link. Select or deselect the desired teeth, and then click (or tap) X. Provider - The provider to associate with this note. Date - The date of the note. Click (or tap) in the field to select a different date. Note - The text of the note. You can add, edit, and delete any of the note text. You can also insert a note from a template where the text cursor is positioned by selecting one of the Templates, responding to prompts to enter data (if applicable), and then clicking Done. Click (or tap) Add Addendum. The options for adding an addendum become available. Select a provider, and add any relevant notes. Note: The addendum cannot be edited once you save it. What do people do for assistants writing notes?